A sad anniversary is approaching. December 26 marks 10 years since the massive tsunami hit 14 countries across Asia and Africa, killing 230,000 people, displacing millions and leaving many coastal communities devastated. 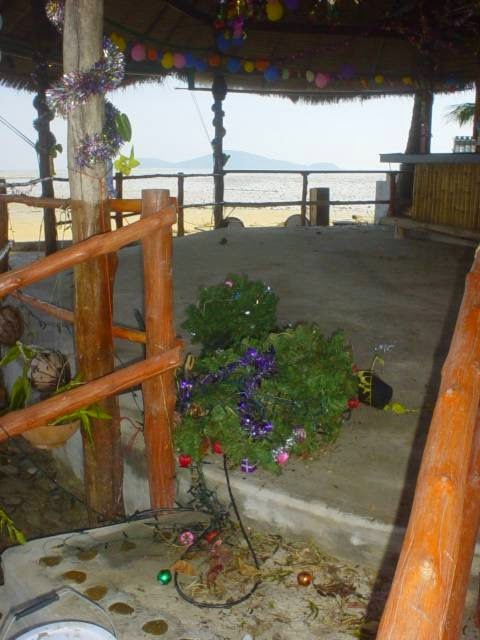 Patong beach 5-year anniversary memorial service, December 2009. 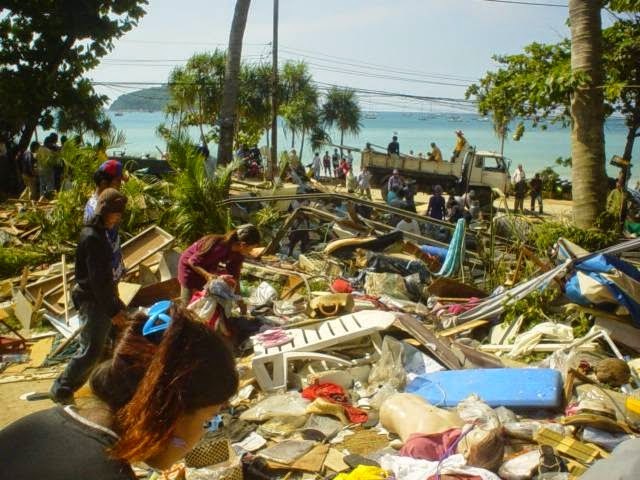 When the tsunami hit Phuket about 10am on a Sunday morning, I was sitting at home with my husband, well inland and completely oblivious to the disaster happening just a few kilometres away along the shoreline. Later that morning, my husband heard a report on the radio about big waves hitting Patong, which we were perplexed about – the sun was shining and the air was still. Maybe it was something to do with the full moon, we surmised. We carried on with our relaxing day at home, my main concern at that time trying to keep cool in my full-term pregnant state. Our first child was due within a week or so. Soon after, my mom called from Canada. “What’s this about a tsunami on Phuket?” she asked. She’d heard about it on the radio as she was driving home from her family Christmas dinner. I had no idea, I said. We were on our way to a beachside restaurant, due to meet my in-laws for lunch. We were stopped at the road approaching the beach, and men standing at the road were stopping all vehicles and telling them to turn around. My husband said to one of the men that we wanted to go to the restaurant up the road. “That restaurant is gone,” he replied. Ok, now it’s looking serious. I thought about friends of mine living on or near the beaches. Thought I’d better call them to ask what was happening. By then, the cell phone service was completely jammed. Couldn’t get through to anyone. Fear and worry set in. At that point we hadn’t seen anything so we had no idea what was going on. In the hours and days that followed, the horror of the event unfolded as pictures and reports trickled in from around Thailand and the region, and we managed to see some of the beaches on Phuket. As a massively pregnant woman who had just taken leave of my writing job at a travel website a few days before, I felt like a completely useless slug, sitting on the sidelines while so many people were in need of help. With (thankfully unfounded) fear of infection and disease, I was advised to stay away from the worst-hit areas. Some of my friends and many in the community delved in to assist in myriad ways, from manning the phone lines set up to help people overseas get info on their missing loved ones, to preparing food packs for communities and rescue workers, to even helping with the recovery of the bodies. Unable to venture into the disaster zones, I blogged instead, mostly as a way to make sense of it all and to communicate to friends and family back home in those pre-Facebook and Twitter days. The blog I had at the time is now offline, so below is how I wrote about it, in my shocked, prego-head fog, in the days and weeks that followed the tsunami. I’m overstuffed with turkey and mashed potatoes. My body’s overheated, dripping with sweat even in the air-con. Can’t sleep. Can’t get comfortable. Anyway, I can never sleep on Christmas Eve – a leftover habit from my childhood, when I would listen for Santa and his sleigh. So I get up and sit on the terrace. It’s a beautiful dark morning. The old lady across the road is already up, chopping vegetables on the little stoop outside of the front door of her shack. No other noises or movement, except the soft shushing of the cool breeze through the dry leaves of the kraton tree, and the occasional blip in my belly. Indigestion and baby fighting for space and attention. The moon is nearly full and casting a bright glow through the trees, peeking through the branches as they bend with the wind. Silence. Coolness. Bliss. The sound of bells begins to fill the air. Bells. Bells? What the hell? Church bells for Christmas? What’s going on? Never heard this before, though if I’m ever up at 4am it’s the bleary end of a hard night, not at a day’s beginning when senses are sharp. Then I remember. Monks. The temple’s calling the monks to their morning chant. Bong. Bong. The bells continue. The island is waking up, following an age-old rhythm of life that respects the sun’s searing heat and embraces the cool, dark hours. The new day gently unveils in the pre-dawn stillness. I think of the saffron-robed monks gathering in the temple hall and meditate on lessons learned in nature’s simple glory. I’m sitting here high and dry on a bright sunny day in Phuket, and can’t quite believe the devastation that’s going on along the coast today. A tsunami. Unbelievable. The phone networks are down, which is very frustrating since I have a lot of friends with homes and businesses near the beach. I have no idea whether they’re ok or not. Couldn’t sit at home anymore, so my husband and I went down to Friendship Beach resort, which is on the Rawai beachfront, to make sure everyone there was okay. The guests were clearing out as we arrived – the whole resort was washed over by a giant wave. Lots of damage but thankfully no injuries or deaths. People were slammed around as the wave hit. Very sad to see the resort, which the owner spent two years renovating, including some new rooms that just opened this month, now totally full of mud, debris and smashed glass. This is just one small resort out of hundreds of homes and businesses that must have been devastated by this wave. Amazing how life can take a complete u-turn in just a few seconds. Yesterday, I meditated on nature’s glory. Today, I will ponder its massive force. Just returned from the beaches, where we spent the morning driving around to see how things are after the wave. We didn’t go to Patong, which looked to be the worst hit because the traffic getting in there was too chaotic. Pretty shocking sights. 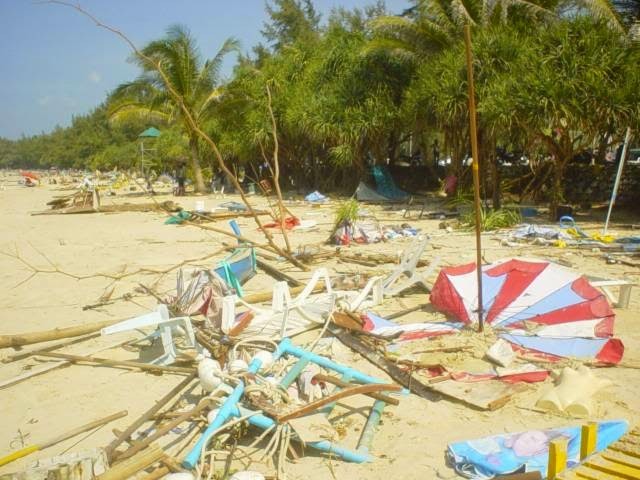 Nai Harn, Kata and Karon beaches covered in broken beach chairs, umbrellas and other debris. Some of my favourite little spots including Lorenzo’s pizza shop in Nai Harn and the group of restaurants at the south end of Kata beach totally destroyed – only piles of rubble and broken timber. Karon beach, December 27, 2004. Shopowners in with half-shocked expressions walking over their destroyed businesses, picking up anything salvageable. Beach vendors and beach massage ladies just sitting on the seawall, looking down at the huge mess on the sand. We watched as a group of workers tried to pull an upside-down car out of the side of a resort in Nai Harn. A small dingy zoomed up to shore with a few people and a twisted motorcycle on it – some wreckage found at sea that they were bringing in. Kata beach, December 27, 2004. In Kata, a small cluster of bars behind Club Med were chock full of mud and garbage, many of the shacks destroyed. In Karon, cars and tuk-tuks strewn around along the sides of the road – one tuk-tuk up on its side against the sign of a resort. A catamaran could be seen wedged against a hotel wall, about 200 metres back from the beach. Pictures in the newspapers today were truly horrifying. I still can’t get through to most people here, though amazingly people in Bangkok and Canada are able to call me. I think about people I know with boat charter businesses, little hotels, snorkel tour companies, etc. How are they? I still don’t know. I won’t know for several days probably. Nai Harn beach, December 27, 2004. I feel a bit helpless at the moment, especially in my 8.5-months’ pregnant state, but I hope I’m able to help out in some capacity in the week ahead. I did manage to get through to my friend who works at the hospital – he thanked me for my offer to help but said they’re so frantic right now he couldn’t think of what I could do. Hoping and praying my baby can hang in there for a while yet – I don’t want to add to the burden of hospital staff this week. 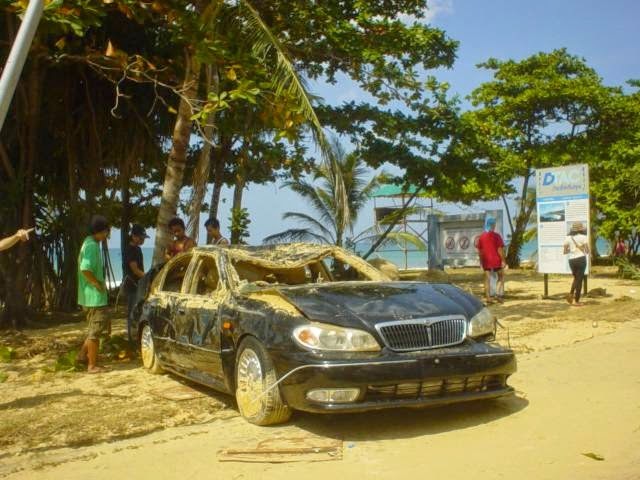 On December 26, Phuket Island felt the impact of a giant wave crash against its shore. Today, and in the days to follow, the emotional impact is rising and spreading. Its power is much more subtle than a tsunami, but its impression will last far longer than the physical destruction wrought by the sea. Today I went to the hospital for my weekly pre-natal checkup, not even sure if the doctor would be able to see me but I was unable to call ahead. I walked through the doors and saw [name redacted] sitting in a wheelchair covered in bandages and bruises. I asked how he was doing. “I’m ok. But my baby didn’t make it,” he said. His lovely little girl, who was born in early May. I only saw her once, when she was a few weeks old. I remember seeing his wife looking serenely down at her newborn daughter as she breastfed her at the beachfront restaurant we were gathered at. On Sunday, on a whim, they decided to go to Patong and were strolling along the beachfront when the tsunami hit. I don’t know the details of the unimaginable horror and chaos that they must have experienced in the swirling water afterwards, as he was too upset to talk about it. I hugged him and went for my checkup. I was holding everything in, until the nurse taking my blood pressure said she needed to check it again, since it seemed unusually high. I started to explain that I’d just heard some bad news, which had probably raised my blood pressure, and began to cry uncontrollably. The shock of what I’d just heard and the masses of injured people all around me were just too much to take. The nurses were sweet and consoling, and led me over to the waiting area to wait for the doctor. He did an ultrasound check to try to estimate my baby’s weight. While I looked at the little miracle of life moving around on the screen above me I was overcome with a jumbled mix of emotions; tears were running down the sides of my face as I lay on the bed. Now, as I write, I still don’t know what to feel, what to say, what to do. The losses are piling up. I’m so thankful every time I see a familiar face – one more person safe and alive. I’ve given my husband about a thousand hugs today, and feel so happy every time I feel my baby move inside my belly. My prayers go out to everyone who has been hurt or affected by this awful, awful disaster. After a terribly upsetting morning I was desperate to find some peace and something hopeful, so my husband and I went down to Chalong temple. There are few better places to go when the mind is frayed than a Thai temple. To see people kneeling in front of the Buddha with their hands pressed together in prayer, as the sweet smell of incense floats through the hall, is a picture of serenity. It’s a moving, silent ritual that Thais can be seen doing every day across the country, yet today it seemed more profound. You could sense that many had experienced loss, or, like me, were shocked and horrified at things they had seen or heard after the tsunami hit. Afterwards, we went to a small Chinese temple in Phuket Town, where they were receiving donations of clothing, food and cash for the victims. It was very busy – many had come out to offer something. Some, I could see, were handing over thousands of baht in cash. Donation centre for coffins, Phuket Town, December 2004. Like many things in Thailand, the act of donating is steeped in religious significance and ceremony. When we handed over some money we were given a piece of pink paper, upon which we wrote our names and posted to a stack of coffins. The whole stack was covered in pink sheets. Each donation sheet represented a coffin that could be built for someone whose family could not afford to give them a proper cremation or burial. We were also given a yellow sheet of paper, which we took inside the temple, and, after praying to the Chinese god with incense sticks between our hands, we set on fire and put in a bowl. This was done to pay respect to all the victims. It was incredibly moving to see the heartfelt acts of kindness, the efficiency and dedication of all the temple volunteers, and the quiet way in which people express their reverence for things. Clean-up efforts are in full force in Phuket, and now many of the beaches – aside from Patong and Kamala, which were hardest hit – are almost back to normal. I drove along Karon Beach yesterday and saw a lot of sunbathers lining its shores, and people relaxing by the pools of their hotels. In stark contrast, Khao Lak, on the mainland just north of Phuket, will probably never be the same. What I’ve heard from friends who went up there, and what I’ve seen in the news, is shocking. Two hundred people are still unaccounted for at one hotel alone. An area stretching 1 km back from the shoreline and 1.5 km wide was completely flattened – my friend said that what was left of the hotels there was a knee-high mess of rubble and mud. Phi Phi Island looks like a warzone. I shudder when I think of the destruction and death there, in that tiny area which would have been packed with people at its busiest time of year. 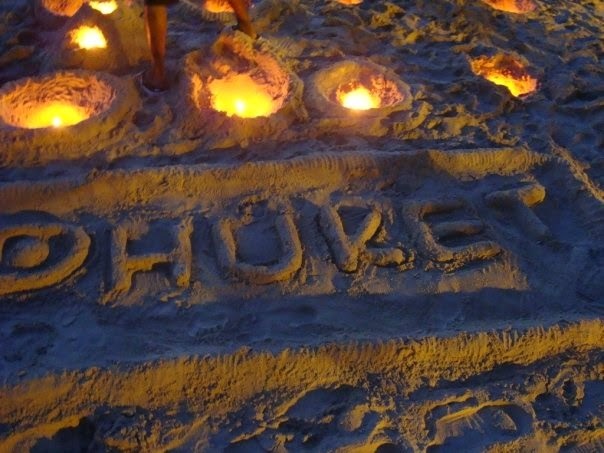 For me, Phuket is my home, while Khao Lak and Phi Phi are both places I go to for mini-breaks. I first went to Phi Phi nearly 10 years ago and remember walking along the beach with a small herd of goats trotting along in front of me. Then, and every time I’ve returned, I’ve met fantastic people from all over the world, and partied and played and restored my soul. While it was in grave danger of ruining itself with overdevelopment, Phi Phi was still a magical place. It was where I tested my mettle by snorkeling with the sharks. It was where I spent a fun few days with my 22-year-old cousin, which, combined with some other things that happened around the same time, convinced me to drop my job and go freelance. It was where I cracked jokes sitting on the sand under a clear starry sky at 3 am with an American musician I’d met. It was here that I enjoyed my last big hurrah on a ‘girl’s weekend out’ with friends a week before I discovered I was pregnant. Khao Lak’s beauty was more subtle. Its beaches were not as spectacular as Phuket’s or Phi Phi’s, but its endless stretch of golden sand was inviting, and there was something special in the quality of the light in the coconut grove on a late afternoon. There was absolutely nothing to do there, and that was the point. Lazy days spent reading in the hammock at Mai’s Quiet Zone or sipping a banana shake on the balcony of my hut at Wunder bungalow on Bang Niang beach, gazing out to sea. I can’t even comprehend how this peaceful image has now been replaced by its present reality – that very beach now littered with swimsuit-clad bodies; nothing left but piles of debris. Can one ever again relax on the shorefront without thinking about the staggering loss of life that occurred here? The buildings may be rebuilt, the hotels may reopen, but will that carefree feeling – the promise of tropical paradise – ever return? It’s 12.01 am on New Year’s Day, 2005. I can hear firecrackers exploding all around my home, and just watched a fireworks show being set off from Chalong Bay from my upstairs window. A night of celebration, and also remembrance. 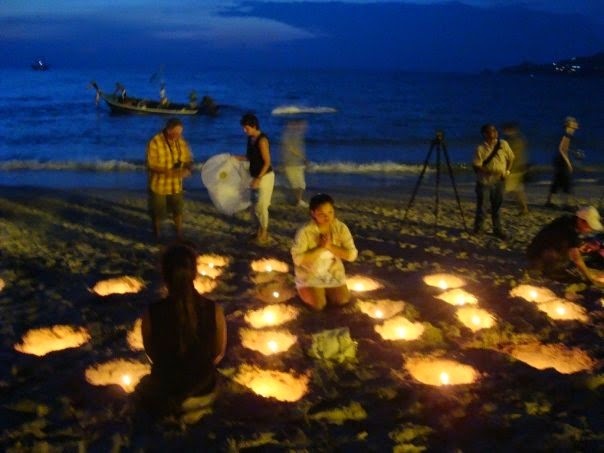 In Patong tonight, they are holding a candlelight vigil for the tsunami victims, with a moment of silence at midnight. The year that closed with a hellish nightmare for Phuket and a vast stretch of Asia’s coastlines is now over. It’s now time for those hit by the disaster to start mending their shattered lives – a task that may still seem insurmountable to many. Indeed, many may never recover what they’ve lost. I still can’t find words to express the feeling of being in the midst of all this, alive and unscathed in my comfortable home, while tens of thousands in the region that surrounds me have perished and millions more are suffering. I have been blessed with a child, who is due to arrive any day now. He is just one of so many blessings in my life. The outpouring of love and support from family, friends and even people I don’t know from around the globe over the last week has reminded me again of just how lucky I am. Even the simplest things are to be cherished, like this glass of fresh water that I drink. For a countless number of people today, a sip of clean water is a dream. My new year’s resolution, and life’s resolution, is to remember to greet each new day as a gift from God that I shall not squander. It’s exactly one week after the day that Asia was severely shaken by the earthquake and tsunami. All the thoughts and anxieties I had in my mind a week ago seem now to be so petty and insubstantial. The scale of devastation and death will forever alter my perception of what’s important, what’s a ‘big deal’, what’s worth worrying about. Like the force of a wave, strong emotions propelled me along all week in a whirling, confusing mix that seemed beyond my control. I’m now numb and unable to absorb any more – I hit refresh on my bookmarked news site and the death toll jumps another 20,000. The numbers swirl before my eyes as the brain tries to process the immensity of pain felt in just one death. But 10,000? 100,000? How will those that remain even begin to cope with the losses? With the stories I read and hear, and the countless others I will never know about, it’s hard not to drown in despair. But as a fortunate, healthy person I must remember that I owe it to those I love, and my community also, to use all I’ve learned this week as an energizing force that will hopefully help to do some good in this world. Wallowing in pain seems almost selfish now. Earthquake and tsunami expert Smith Dhammasaroj said that when he was chief meteorologist in 1993 he had warned southern provincial governors they might be “dangerously affected” by deadly tsunamis and issued a follow-up warning in 1998 after a tsunami had hit Papua New Guinea. Hi Lana, yes, thanks very much for your kind thoughts. We’re okay. A close one, we were in the house when the first wave broke through our deck. Will copy you, with our news. …And many more emotions that probably won’t completely unravel and reveal themselves till the initial shocks subside. Today, I’m wiped out from all the tension and worry I’ve experienced this week. But it’s good to feel. It’s very, very good to feel alive. So here I sit in an abyss of time between one of the biggest natural disasters on the planet and the birth of my first child. Tick, tick, tick. I wait and worry and watch the fallout from the tsunami from within the safety of my home, at the same time anticipating signs of labor to start at any moment. Unlike other areas, Phuket has emerged relatively unscathed. Safari trucks are again rumbling down my road and up to the hills, full of excited tourists looking forward to their first elephant ride. Beaches are peaceful scenes of people sunning themselves and swimming. The markets are as bustling and colorful as ever. Panic and horror has largely been replaced by determination and relief. Who would have thought before that a death toll of “only” 280 people, the final tally in Phuket, would be something to be thankful for? Since the waves hit, I’ve come to realize more than ever that my friends and family are a deep well that I can draw from in times of need. I’ve regained contact with old friends, including the group of university students with whom I first discovered and explored Thailand 10 years ago on an international exchange program. We’re now planning a reunion for later this year. I’ve been touched again and again by the outpouring of support and love from so many people near and far. I ran into a couple I know at a shopping centre the other day — a couple with a beachfront house who I was unable to contact for five days, not knowing if they had survived. Though they lost their beautiful new home, you’d never know it from their faces. They were happy and jovial and downplayed their tribulations, so grateful that they and their three dogs not only lived, but were quickly taken in by friends and taken care of by their neighbors. I have a renewed appreciation of my community, and the spirit of the people in cleaning and rebuilding the island has been inspiring. The ways in which the island, the country, and indeed the whole world has responded to this crisis has been reason to restore my faith in the goodness of people. As I await the delivery of my baby, I have a lot to be thankful for, and a lot to reflect on. The things I’ve learned since the day the tsunami struck will hopefully make me a better mother, and a better person. Most of all, it’s taught me that love and joy within the human heart are boundless. On January 9, 2005, our healthy baby boy was born. I’ve been a mom for a week now and it’s finally settling in that my life has changed forever. I look at the fresh little face of my baby boy with awe; his ever-changing expressions are a delight and a mystery. It’s hard to write about the feelings he invokes in me without sounding cliché: the innocence of a child, the marvel of a newborn. He’s the most beautiful thing that’s ever happened in my life. But my thoughts have not all been positive. There is sorrow over the loss of my former ‘freedom’ to come and go as I please. A half-hour shopping trip yesterday was frantic and full of panic over leaving my baby, even though he was safe at home with my husband. I’ve been reduced to tears of frustration for my inability to control things – I cannot schedule his hunger, I cannot always stop him from crying, I cannot keep him from spurting poo and pee all over when the diaper’s off. I’m tired. I never seem to have enough time to eat, or finish a meal before my breast is demanded again. Sometimes the feedings are really easy, other times it’s incredibly hard. My body’s still in pain from the labour, plus there’s new pains in my neck, back, shoulders, arms. I look like hell, with breastmilk and pee stains on my shirt, unwashed hair pulled back in a messy ponytail, unshaved legs. The uniform of a new mother I guess. Smiles, tears, ups and downs. It’s been quite a ride so far. 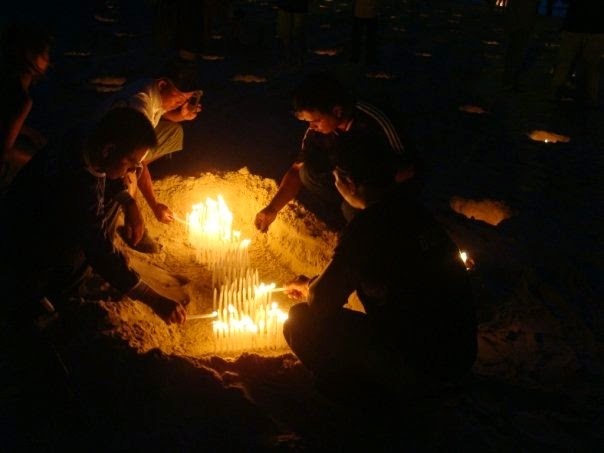 Candles in the sand, remembering the tsunami, Patong beach. “I lost my parents, my two great doggies, my cat, my home and my business. I almost drowned under the roof of a bungalow. I stated that I would visit the beach one final time, never to return. “I said to a friend of mine – who lost his fiancée, unborn child and parents – that I would spit into the sea, curse it and beat it with a stick before heading to somewhere such as the mountains of Canada, where I would never again have to set eyes upon the sea. “I was an enthusiastic diver, underwater photographer and all-round sea-lover before, so I hope that this gives the reader some idea of how it can feel to go through such a physical and emotional nightmare. Suddenly the losses and pains I’ve suffered from having a baby seem trite. They’re not really losses at all – my entire existence did change in a flash, but the result is that I have a new life in my arms. The writer, and many others around me, have nothing, and yet they still have hope. That the writer wishes to reconnect with an ocean that swept everything away from him shows an incredibly trusting and loving attitude towards nature and its ability to heal. Such strength I am only beginning to discover. I may never find such strength. I need to remember that every cry, every scream, is a life force asking to be heard, and a miracle. I’ve created a child, yes, but actually it is he who is creating me.